Bloom Properties to Demonstrate How They Are Taking Dubai Modern Urban Living to New ‘Bloom Heights’ in Upcoming Wembley Property Roadshow . Renowned property holding company‘Bloom’ are set to create a real buzz at a bespoke upcoming property exhibition to be held at the Wembley Novotel from 30th November – 2nd December. 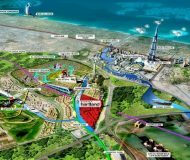 The group plan to unveil their groundbreaking new project ‘Bloom Heights’ which is leading from the front as an integrated, sustainable community in Dubai. Bloom properties have established a name for themselves in Dubai having demonstrated their ability to deliver a range of commercial, residential and mixed use projects to various prominent locations of the MENA region. With a reputation for creating communities that offer an enriched quality of life, Bloom have delivered on their promise across a number of developments, all of which boast hospitality, education, retail and healthcare aspects. These groundbreaking Bloom communities in Dubai all offer investors strong rental yields and high capital appreciation potential with the new ‘Bloom Heights’ being no exception. Bloom Heights is primarily aimed at millennial young professionals and families withthe World Expo 2020 site, Mall of the Emirates, Al Maktoum International Airport, Dubai Media City and Downtown Dubai all within 15 to 20 mins drive away. Interested parties will have the opportunity of a presentation or one on one consultation at the bespoke Wembley Novotel exhibition on 30th Nov – 2nd Dec to better understand the unique investment opportunitythat is Bloom Heights.